Author: Tobin, Jacqueline L. Set In . . . Description: The fascinating story of a friendship, a lost tradition, and an incredible discovery, revealing how enslaved men and women made encoded quilts and then used them to navigate their escape on the Underground Railroad. 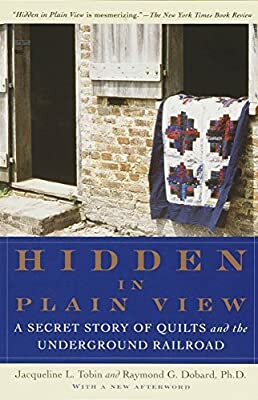 In Hidden in Plain View, historian Jacqueline Tobin and scholar Raymond Dobard offer the first proof that certain quilt patterns, including a prominent one called the Charleston Code, were, in fact, essential tools for escape along the Underground Railroad. In 1993, historian Jacqueline Tobin met African American quilter Ozella Williams amid piles of beautiful handmade quilts in the Old Market Building of Charleston, South Carolina. With the admonition to "write this down," Williams began to describe how slaves made coded quilts and used them to navigate their escape on the Underground Railroad. But just as quickly as she started, Williams stopped, informing Tobin that she would learn the rest when she was "ready." During the three years it took for Williams's narrative to unfold—and as the friendship and trust between the two women grew—Tobin enlisted Raymond Dobard, Ph.D., an art history professor and well-known African American quilter, to help unravel the mystery.